I’ve posted this for DVerse Poets Pub “poetics” prompt “wild” and Gooseberry Garden’s poetry picnic. 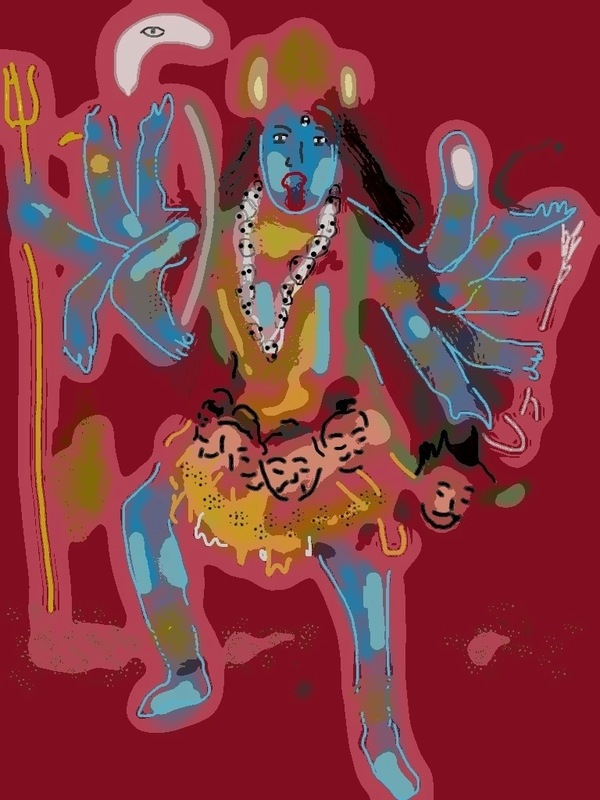 It’s an older poem about the Indian Goddess, Kali. Kali is a Goddess of Destruction, often depicted in a fairly violent, i.e. wild form, but it is my understanding that this destructive force is also an energy that can be channeled in a protective manner–against obstacles! Blocks! Enemies! (She seems to me to be kind of like a life coach mother bear.) At any rate, here’s my effort and a new iPad drawing above. Dear Kali, you are my favorite goddess. that you bear down hard. Make me your third eye. Make me the clasp at your waist. Give me the weight of fifty men, the hook of the chain. Dear Kali, you are my favorite.